Once in control of ANA, Reg Ansett set out to block other competitors who might challenge his airline, launching take-over bids on the Adelaide-based Guinea Airways (renamed Airlines of South Australia) and the Sydney-based Butler Air Transport (renamed Airlines of New South Wales), the later was achieved with (covert) support of the Menzies government, and by Ansett promising his employees' Butler shares, then cementing the take-over by flying his employees to the General Meeting in Sydney, forcing a vote in favour of selling out to Ansett. In October 1964, Ansett, on the toss of a coin, was first to land a Boeing 727 in Australia. (TAA followed 1 minute later). 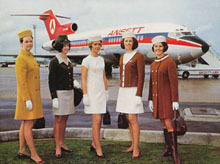 By 1969, Ansett had achieved the status of Australia's largest domestic airline by continuing to consume many smaller airlines and subsiduaries in all states. East-West Airlines, located in country New South Wales, was also taken over by Ansett. In 1979 Ansett Transport Industries (ATI) passed to a large consortium of the transport giant TNT and the multi-media corporation News Ltd, and by 1980 it was a totally separate company, with Ansett Air Freight being formed to maintain the airline operations. Ultimately the ATI identity would be divided with News Ltd extracting the TV channels and networks, leaving only the airline section to continue, and Ansett's road transport being consumed within TNT. Ansett Australia operated its first international flight on 11 September 1993, and Air New Zealand purchased 50% of Ansett Australia on 1 October 1996, purchasing the remaining 50% on 13 June 2000. Ansett Australia, Ansett International, Air New Zealand and Singapore Airlines joined the Star Global Alliance, the largest in the Asia-Pacific region, and at 30 June 2001, Ansett's fleet consisted of 67 aircraft, including 24 Boeing 737-300s, 20 Airbus A320-200s and 9 Boeing 767-200 aircraft, plus the regional airlines in the Ansett Group, - Kendall Airlines, Aeropelican, Hazelton Airlines and Skywest Airlines together comprising a fleet of 53 aircraft, including 11 CRJ-200 jet aircraft. 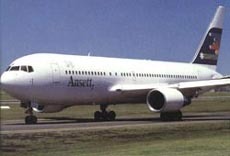 On 14 September 2001, with cash flow and liquidity problems Ansett Australia was placed into voluntary administration and all operations of the group ceased. Like TAA, Ansett, which had served and publically and visually competed on the domestic network, developing what was now the most extensive network serving all communities, was no more, and again our history was being discarded, destroyed and derided by the need to recover lost and misguided financal losses. It was TAA and Ansett that developed, maintained the network that serves Australia today.